The topic examined concerned the prevalence of star formation within galaxies. The term “prevalence” refers to the presence and quantitative extent to which stars exist within a galaxy. The variables examined across a sample of galaxies were, for each galaxy, its morphology and the portion of its mass attributable to stars. The intention of the study was to examine the two aspects of the galaxies and to determine if any correlation existed between the quantity of galaxies with one aspect and the quantity galaxies with the other (i.e., the quantity of galaxies with a morphology and the quantity of galaxies with a stellar mass, and if expressions of the aspects tend to cooccur). The topic of inquiry was chosen for the logistic capabilities of answering it. Second, an evaluative examination of the provided literature did not answer the question. Furthermore, an examination of literature beyond that which references the database provided did not provide a conclusion/answer to the question. Finally, the topic was not the most familiar, astronomy is not a staple course, and so the greater opportunity for acquiring new knowledge lies in an analysis of the more foreign dataset. The topic of inquiry provided more new learning opportunities than the other topics, and it seems unambitious to select a topic within one’s present range of knowledge or “comfort-zone.” The specific research question is interesting for members of the field and those answering it, it is answerable, and it had not been answered. Some information was gained during the review of literature provided by the instructors; however, the main gain in information arose from an independent survey of the literature available within the field, online. This occurred in a self-guided manner and was not a part of any lesson in the course, or from the materials of the course. The information reviewed and absorbed included a general understanding of galaxy composition and evolution. Of course, this overview resulted in exposure to (and consequently understanding of) terminology used within the field and specific to the topic. In addition to sorting out the confusing expressions and articulations of those cited as authoring the literature provided in the course, this self-instruction provided an overview of the role of star aging in the life of a galaxy, and vice-versa. The information attained from a review of articles, books, and websites provided a clearer summary of the interaction between stars and galaxies throughout the evolution of galaxies. Further inquiry should consider the extent to which the conclusions and findings of the study hold true throughout the universe. The dataset examined was not extremely limited; however, should a grander collection of information take place and the resulting dataset be released for public access, the study should be repeated. Doing so would allow for a comparison of findings between the larger dataset and the one examined in this study. Pending the results of the aforementioned comparison, further theorization of galaxy aging and star formation should take place. Should the conclusions of this study be validated, more serious examination into the causes contributing to the observed conclusions may take place, given the grounds for a dedication of resources. Should the conclusions of the study contradict those of this study, opportunities for inquiry into the topic would expand exponentially; new methods for identification of galaxy properties might be necessary given an inexplicable distinction between the two sets of galaxies. The research project was successful for more reasons than simply the answering of the research question: the conclusions proved far more interesting, as literature examinations would support the hypothesis that the data contradicted. As such, an examination of the interaction between the concepts informing the hypothesis and the factors behind the results of the data analysis would prove fascinating for many and provide numerous opportunities for theorization. This theorization could range from topics of star formation within the Milky Way to the distribution of matter within the universe. I am a student with interest in research. I enjoyed my research and helping contribute to the field. This has been a great experience for me. I was able to learn a lot and meet new people. This also helped me learn to socialize more and better with others. With this I was able to work well with me two partners and friends J’Mari and Miguel on a project that interested us all in the end. The project we worked on was the Milky Way Project in which had revolved around the topic of bubbles. The reason I have chosen this project is because I have a good interest in space and galaxies, it looked a bit more interesting than the others, and I had a lot of questions about this topic. The tools we used on this project were iPython Notebook, Wix.com, and Code Academy. iPython Notebook is one tool we used to complete are plots and analyze data by coding in a language known as Python in order to do certain tasks. We used Wix.com to build our website in which we can post our data and share it with the world. And we used Code Academy to help us with the basics of coding and Python. I did make a few discoveries in the process. There were a lot of things that I was not aware of, or did not know about at the beginning that I do know about now, such as, what “bubbles” are. From the start of this program I had absolutely no idea of what a bubble in space was, but now I can say that bubbles are primary star forming, or birth region composed of partials and gasses. 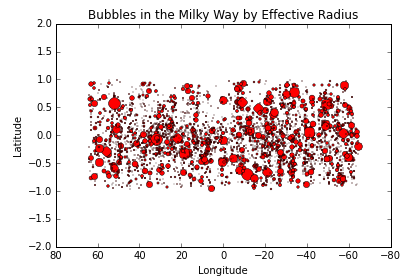 Some things I really found interesting was how the plots turned out in the end, which areas had more bubbles than others, and the things you can do and accomplish using coding and Python. The plots showed a wide range of bubbles and their position, and in one case their size. This was quite amazing because it added a different perspective to the question and our mindset. The plots also had shown a variation in population of bubbles in certain areas. This one of the plots we made that was really important to our research and finding the answer to our question; although, we are yet to have found an answer to your question. Some questions I would try to answer if given the chance or time to are: What is the relationship, or what are some similarities between various bubbles and their area (if there is any), how does the area where the bubbles are located affect the amount of bubbles found in that area, if bubbles with stars of different classes were to combine, what would be the outcome? My name is J’khai Walters and a I am an After School Matters apprentice here at the Adler. I am also a junior in high school and this my first time ever doing something like this and I have to say that I really enjoyed it here. One interesting thing I learned from the project was that star clusters actually get smaller over time, rather than expanding as it gets older. This only applies to open star clusters. If given the chance, I would like to study what happens to globular star clusters (the opposite of an open star cluster) as they age. I am curious whether or not they will become smaller in diameter like open star clusters, or actually become bigger in diameter. Throughout this project, there were many fun and new experiences as well as some new and challenging obstacles. Some fun experiences I had were working with new people, learning about new topics and trying to understand them. There were also some tough and challenging obstacles to overcome throughout the program. It was challenging trying to learn python and implementing what we learn into our project. Not to mention how tough it was trying to understand scientific papers and topic other scientists had written before. One very fun new experience I had during the project was working with new people and learning new topics. If I were working on this project by myself, I do not think that I would have enjoyed it as much because there would not be anyone to bounce ideas off of. By having my group members however, I was able to learn and look at these topics from different perspectives. I also love solving problems. While we were working on codecademy, I came across many problems and code related issues during the course. It was tough trying to solve them but it was also a very fun and rewarding experience. There were some tough and challenging aspects of this project. The first challenging part of this project was understanding the science behind the Milky Way Galaxy project. We read papers written by researchers about star clusters, star forming regions, and a whole bunch of information related to them. It was a lot of information to take in at first, but we were able to slowly understand what the research papers were about. The second challenging aspect of the project was the coding part. The basics of python were pretty simple, but as soon as we jumped into plotting the data and formatting it, things got a bit complicated and it was harder to understand some of the topics the scientists were talking about. It took some time, but our group was able to successfully input and program all the data we had on star clusters into a nice graph and table to present to others. Before attending this program, I never would have thought much about stars or star clusters and how interesting they were. I recommend that anyone interested in astronomy and coding apply and take part of this program because of how engaging and fun the experience is. My time as an astro-journalist was amazing. The challenges it led to the project were difficult. But, I learned new tools to aid me in completing these challenges. When overcoming these challenges, I made new discoveries that were quite exciting. I also learned small bits of info that were not too exciting but not too important. One of these tools I learned that aided me on completing these challenges was python coding. There were certain things I needed to make that required coding such as a double bar graph. The bar graph needed to show how galaxy’s show aging and how their stellar mass affects what they are or what they are categorized as. Our research question to our project needed a demonstration that used a graph. The question was “ Does there exist any correlation between galaxy type and the quantity of stars within a galaxy?” I tried using Microsoft Excel but instead made one that needed coding. I did make but it looked so terrible that it was used a demonstration on what it would look like if it wasn’t done right. 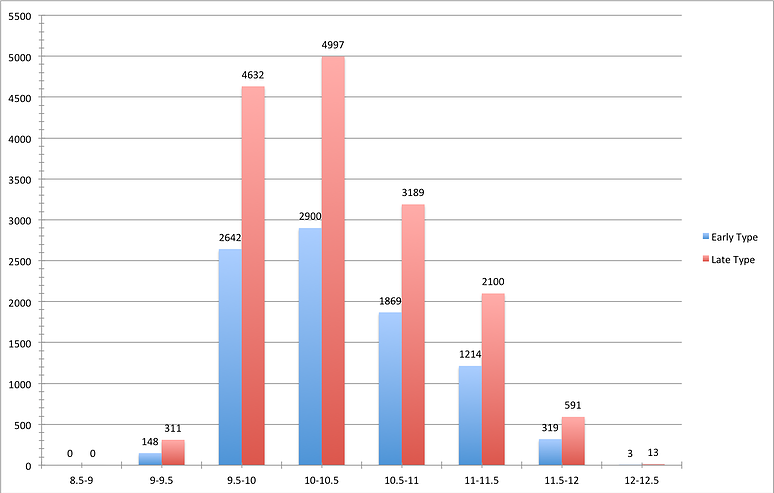 The data used in my graph was incorrect, the bars in the graph themselves looked the same, and all around unappealing. It was hilarious that it was used that way but I knew it wasn’t going to get used any other way. The discovery that I found quite exciting when completing these challenges was how the amount of dust content affect Red spiral galaxies. The graphs also told a lot about our research. 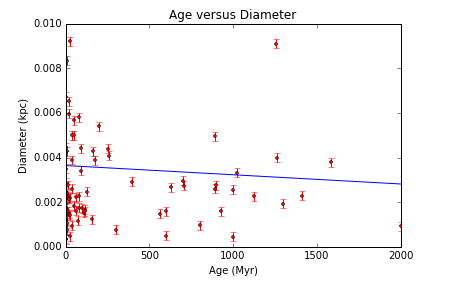 Such as, how galaxies show no correlation between galaxy age and stellar mass. Most of the discoveries I made during the time I was making the site were through the data sets. It showed lots of interesting data, like how almost nothing changes in the stellar mass. I discovered this during plotting on my graph. There were also little things I learned along the way such as how to properly present our hypothesis and research question. Up until now, I used to just say the question and hypothesis but now I explained what the plots were and what they meant. It was really nerve wreaking and I just looked like a train wreck. But I managed to pull it off, even if it was pretty bad. I also learned how to be calm and mellow during the presentation. I know it may not seem like much, but it was really challenging for me because I’m such a shy person to new people. But once you get know me I’m really a fun person. These thing’s aren’t related to my project, but these were challenges to my that I had to face. As we have worked at the Adler, we have all made many different choices. We choose our research project, we choose our websites to use etc. These choices have paved the way for all of our experiences here, making each one of our experiences both original and special. Let’s go and review some of the choices I’ve made to pave out my own experience here. The question that I chose to research was “do galaxy pairs tend to be more similar in classification when they are closer to one another?” We had spent some time reviewing what a good research question would be and I chose this because it seemed to fit those qualifications we had talked of. Also it seemed very interesting to me, because I hear all the time about galaxies and their various types, but how often have you heard about the similarities of galaxies in a pair? When I first set out to figure out the answer to this question, there were a few skills I had to make sure that I could learn. Of course I had to make sure that I had figured out how to create the necessary plots via python, but even before that I had to make sure that I was able to efficiently and accurately find data and put it into my code. These things ensured that I could complete the project. After getting the results of this project, I learned many interesting and amazing things. First of all, I found a relationship between distance and classification. Even though the types of data we were looking at were two seemingly very different types of data: data regarding distance and data regarding qualities. I also learned from the Adler Astronomers during our first presentation. I learned that galaxy spiral pairs could be potentially colliding to make elliptical galaxies. Now that I have completed this project, new questions of course come to mind. For example, do similar galaxy pairs tend to be more common in certain places? Do pairs with stronger gravitational pulls tend to me even more similar? The beauty of this program is that we will always have more questions to ask, and now we know how to answer these questions. What would you ask? 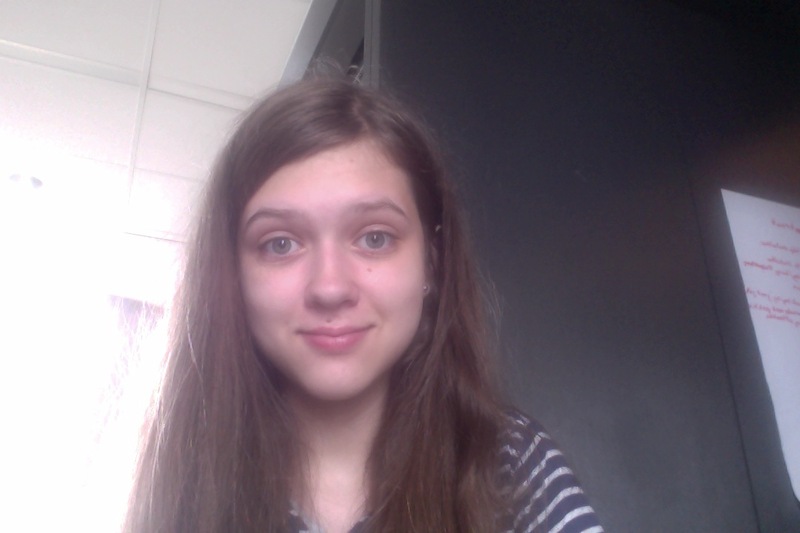 My name is Lillian J, I am a Freshman at Walter Payton. I have worked at the Adler Planetarium for the past 6 weeks.